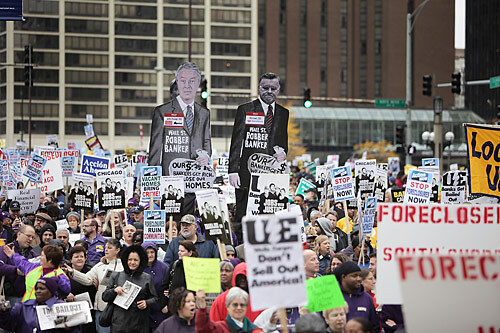 At the annual American Bankers Association conference in Chicago, protesters faced off against the bankers who refused to extend them credit even after getting bailed out. 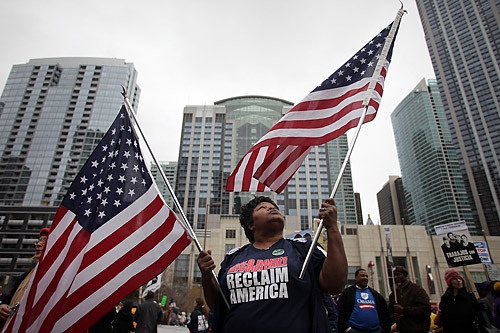 Susan Smith, 62, of Newburgh, NY waves flags at a protest of the American Bankers Association Tuesday, Oct. 27, 2009 in Chicago. All images by David Barreda. 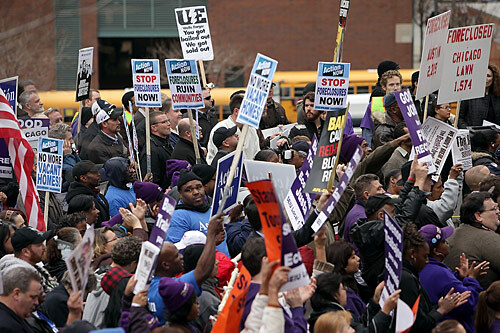 Thousands of protesters chant their support for a new Consumer Financial Protection Agency. 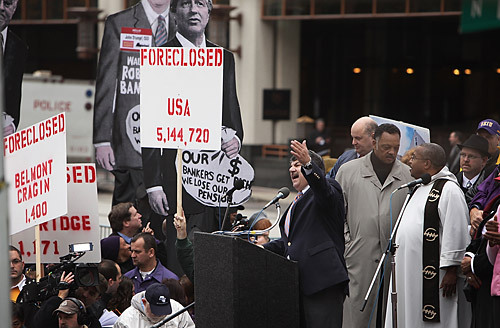 The American Bankers Association is lobbying fiercely against the CPFA and other proposed reforms. 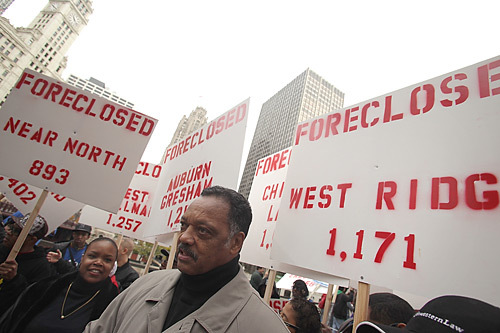 Pastor Clarence George, 48, of Chicago’s South Side, holds up signs protesting the wave of home foreclosures at the head of the march. 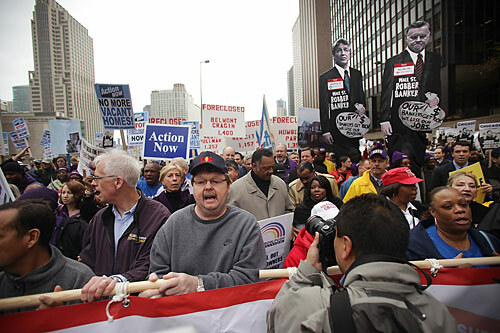 Keith Scribner, president of UE Local 1174 in Moline, Ill. (center, in blue hat). He lost his job last month, along with a hundred of his fellow union members, when Quad City Die Casting shut down because Wells Fargo refused to extend the company needed credit. 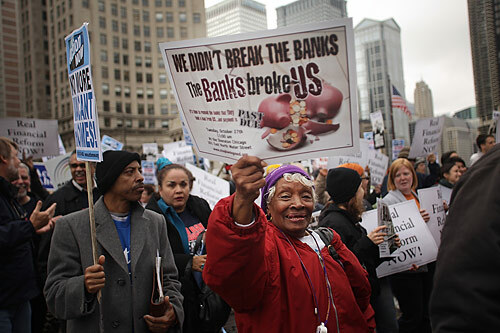 Marching down Michigan Avenue in downtown Chicago on day three of the anti-banker protests dubbed The Showdown in Chicago. 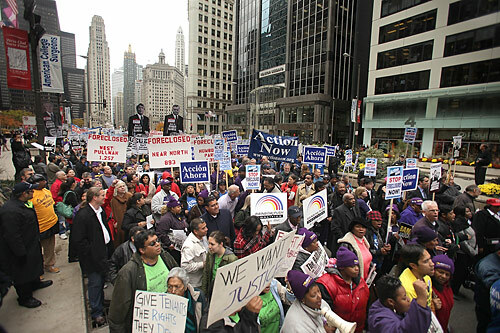 Chicago resident Henry James, 55, marches with Action Now, a local community organization. 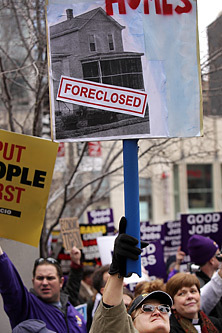 James says his house is being foreclosed on and he was recently let go from his job as a substance abuse counselor. 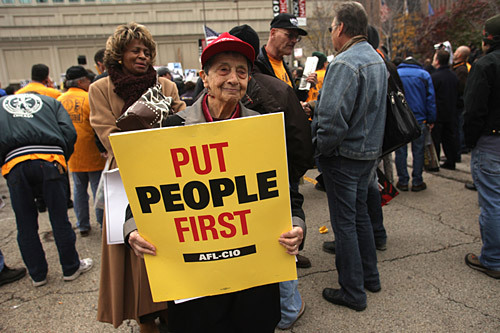 Helen Owens, 80, of Chicago. Owens recently had to move out of her home of 16 years to a smaller place because she couldn’t afford to pay her heat and electricity bills. 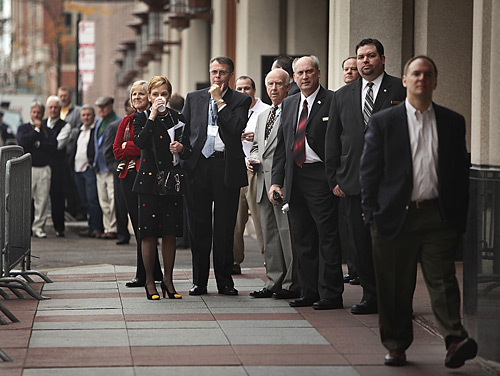 With wary eyes, participants in the American Bankers Association annual meeting watch from outside the Sheraton Hotel as thousands of protesters arrive for a closing rally. 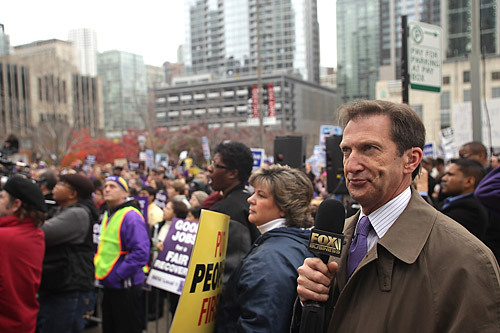 Fox Business reporter Jeff Flock listens to speakers rail against Wall Street. 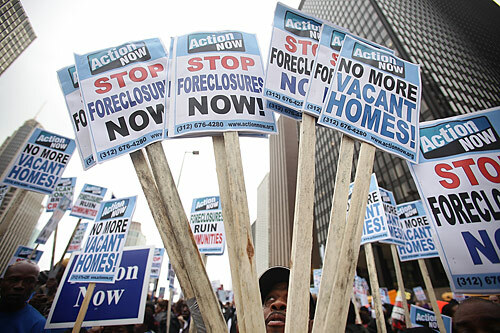 Signs held by protesters give the number of foreclosed homes in communities across the Chicago area. Leticia Pescador, an office cleaner, and her daughter Guadalupe, 8, join the crowd at the Showdown. Pescador’s husband, a construction worker, has found very little work in the past year. 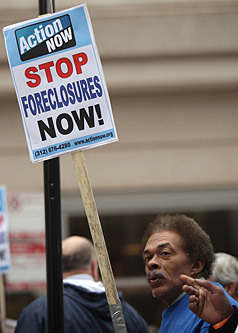 Rickie Coleman, an activist with Sunflower Community Action, a community organization based in Wichita, Kan., holds a sign protesting foreclosures. 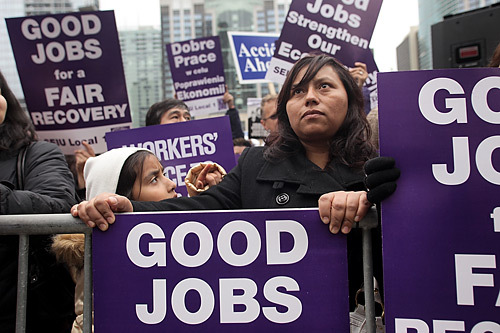 Nivia Ortiz, one of dozens of garment workers from the Hart Marx apparel factory in Chicago who joined the protest. 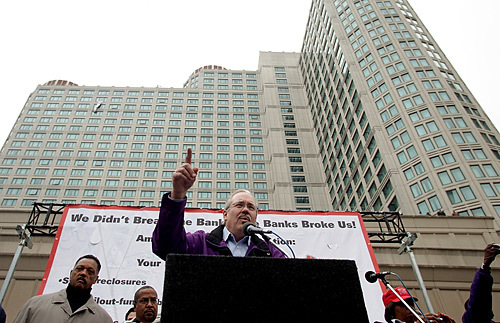 Hart Marx’s creditor Wells Fargo, the recipient of $25 billion in bailout funds, decided to liquidate the company earlier this year. 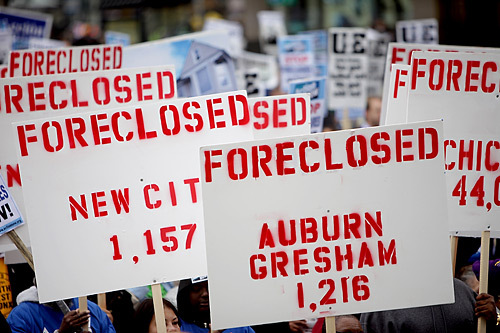 Protests forced the bank to reverse that decision. 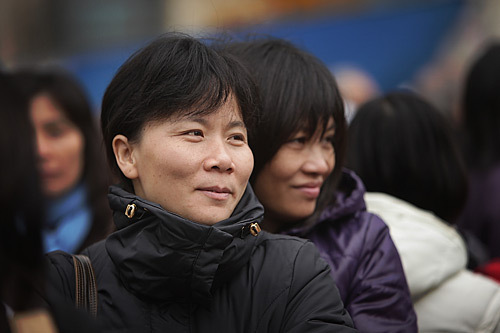 More garment workers from Hart Marx, suit maker to President Obama. 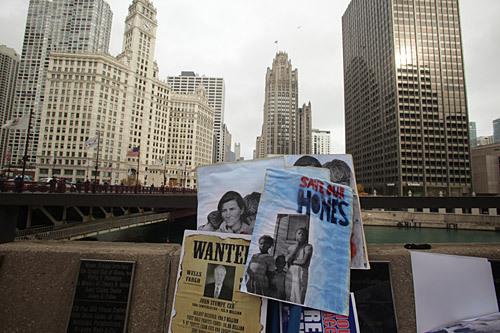 Beatrice Lumpkin, 91, says there are more than 1,000 boarded up homes in her Chicago neighborhood of South Shore. 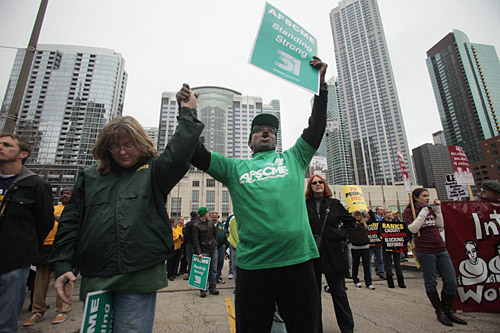 Members of IBEW Local 21, Donna Couch, left, of Steger, Ill., and Abram Hackman of Chicago, both administrative assistants, pray and cheer at the Showdown.